As an original member of the Percussion Group Cincinnati (PGC), James Culley has recorded with PCG for the ars moderno, CDCM, Opus One, Einstein and EMF labels, and performed throughout the U.S. and abroad. He has directed CCM's Percussion Ensemble for thirty-one years, promoting new works by CCM student composers and specializing in performances of unconducted, full-score pieces. This student group has performed at Percussive Arts Society International Conventions in Nashville, St. Louis, and Columbus. In 1998 he received the Ernest N. Glover Outstanding Teaching Award for CCM. 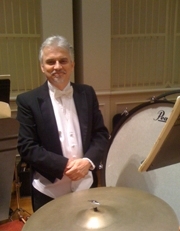 Culley has performed as an extra percussionist in the Cincinnati Symphony and Cincinnati Opera Orchestras, Cincinnati Chamber Orchestra, Columbus Symphony, Chautauqua Festival Orchestra, West Virginia Symphony, Columbus Pro Musica Chamber Orchestra and Summit Brass, and he freelances as timpanist/percussionist in regional orchestras. BA and BM, Oberlin College, Oberlin, OH. MM, Eastman School of Music, Rochester, NY.